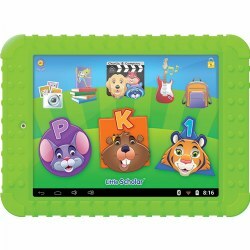 Kaplan offers electronic aids in reading, vocabulary, and language development that are disguised as fun activity sets and books. 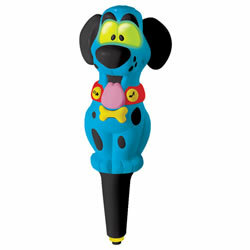 Products also include headphones, assessment recorders, Hot Dots Jr. pens, and more. 4 years & up. 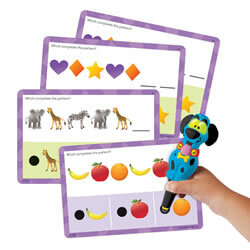 Designed for little hands, this electronic canine pal cheers for correct answers and gently redirects children when they answer incorrectly, allowing for independent discovery. Simply press the tip down on the cards to answer. Sets of 36 colorfully illustrated doubled-sided cards (sold separately) provide 72 early learning activities each, plus answer key. Cards measure 4"H x 6"W. Requires 2 "AAA" batteries, not included. 4 years & up. 36 colorfully illustrated doubled-sided cards provide 72 early learning activities with uppercase & lowercase letters and sequencing, plus answer key. A great way to get ready for school! Cards measure 4"H x 6"W. Hot Dots® Jr. Pen sold separately. 4 years & up. 36 colorfully illustrated doubled-sided cards provide 72 early learning activities. 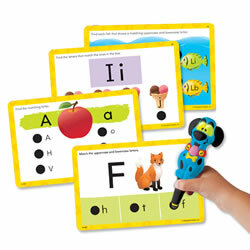 Covers initial and final sounds, as well as rhyming words and includes an answer key. A great way to get ready for school! Cards measure 4"H x 6"W. Hot Dots® Jr. Pen sold separately.